BTW, I'm not posting on weekends during vegan MoFo! My high-Fiber Gluten-Free Yeast Bread, baked and photographed by Brenda Wiley. I am not, as you probably noticed, gluten-intolerant. But several years ago, a friend who is asked me for a good gluten-free bread recipe, because the commercial brands were very expensive (up to $9 a loaf in our area), and not very good. I searched many books and website, and most of the bread recipes I found were not very high in fiber, and contained alot of eggs for structure. So, I did some research and came up with a High-Fiber Gluten-Free Flour Mix (I was doing my book "The Fiber for Life Cookbook" at the time), which can be used for breads, but also muffins, cakes, cookies, etc.. I had intended to include it in that book, but there wasn't room. So, it hasn't been published anywhere-- just sent to friends or readers who requested it. I used the flour mix in the yeast bread and produced a loaf that my husband and I (both NOT gluten-intolerant) liked-- the taste and texture were good. I posted the recipe for my newsletter subscribers on their forum, and Brenda Wiley, an adventurous cook and author of the tofu-making page on my website (which is soon migrating to her own in-progress website), was curious about it. "My husband is gluten intolerant, so over the past few years I have discovered how totally different eating gluten free can be. Many items I have tried are "ok for gluten free", but not items I would make just to enjoy for myself (who is able to eat gluten without problems). Then I found this bread recipe. This is honestly THE BEST gluten free bread I've tried (and I've gone through a lot of different recipes). This bread is tasty and enjoyable in its own right ... gluten free or not!" "Her development of a gluten free yeast bread is quite an accomplishment. As noted in other parts of this web site, it is the gluten that gives yeast bread its most wonderful taste and texture. 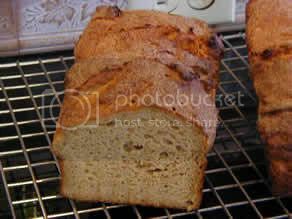 Bryanna has a winner of a recipe here: a tasty bread with wonderful texture." I consider this high praise from a fine cook! You can find the recipes for the Gluten-Free High-Fiber Flour Mix, and my Gluten-Free High-Fiber Bread on Brenda's website. And there are more things to peruse, with lots more to come! So, if you like to make healthful breads, bookmark Brenda's website and check back often! 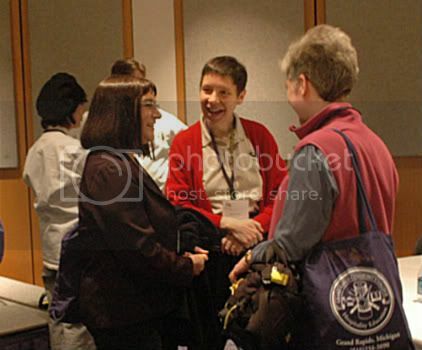 Meeting Brenda Wiley at the 2006 Vegetarian Awakening Conference. this is great for me, i'm gf for the month to see how it affects my fibro. Thanks for pointing this out. I've been dying to make a gluten free yeasted bread! can this recipe be adjusted for a bread maker. anonymous-- I don't know-- it only needs a short mixing-- not really a knead and one rise, so I've never tried it in a bread machine. You'd have to experiment.